Indian women, mainly belonging to 1940’s and 50’s had to struggle hard to lose the stigma of being labeled as aimless rebels and threat to culture. They had to fight many naysayers and also their own mindset, to believe in themselves and build a career. Savitri belongs to that generation. She was able to bring a dignity to actresses on screen and even inspire many women to excel in their careers. Such a person had to feel needed and important even though she had all the success and wealth in the world. She lost all of it, as her broken heart couldn’t heal as the eternal lover and believer in her died, during one weak moment. This is Mahanati movie for you. 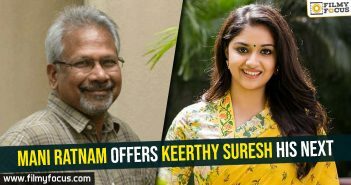 Performances : Keerthy Suresh delivered a performance of a lifetime on screen as Savitri. You cannot imagine any actress even being close to Savitri but she managed to pull it off, not just convincingly but on par with Savitri. In some scenes, it looked like Savitri might have acted in place of her in them. Dulquer Salmaan owned the character of Gemini Ganeshan and did not make the legendary Kadhal Mannan, look like a villain. We see him as a person with human tendencies and flaws. The charm of Dulquer is on par with Gemini Ganeshan. Samantha Akkineni delivered another career-best performance in this movie. Vijay Devarakonda is very good. Rajendra Prasad, Naga Chaitanya, Prakash Raj, Shalini Pandey, Avasarala Srinivas, Krish, Tharun Bhascker, Sandeep Reddy Vanga and other gave their best. Technicalities : Danny Sanchez Lopez’s Cinematography is pitch perfect and he made the bygone era come to life and also the period setting is done very perfectly. His camera work is a huge highlight of the film. Editing by Kotagiri Venkateswara Rao could have been better. Mainly in some crucial scenes, his choice of transitions did not match the intensity of the scene. But his work stood out in smoothly shifting between moods and time periods. Sai Madhav Burra, the dialogue writer of the movie got a chance to write lines for the greats of Cinema and he utilized it very well. Music by Mickey J. Meyer is good and apt for the movie. Mainly, his background score stood out and keeping the mood of the movie, alive, he gave his 100% to the film. Nag Ashwin should be given the major credit for believing in himself to pull off such a herculean task. He made his cast and crew to believe in the idea that Savitri’s life is remarkable and highly interesting to make it as a movie. Hence, he is able to get each and every one of them performs to their best. Analysis : When someone comes with an idea that they want to make a biopic of an actress whose life ended as a huge tragedy, many would stick to a specific melodramatic format. But Nag Ashwin tried to celebrate the strength of a woman who ended up alone while she loathed for love all her life. Her heartbreak and her happy-go-lucky nature are captured dearly by the team and this film is almost like a brilliant painting. Nag Ashwin and his group of artists delivered an art piece that we can remember for many days to come. Savitri deserves such an honest look on her life and a tribute to her memory that can last really long. This is a must watch movie.